2.Please leave a note of which voice you need, or we will send English And white panel as default. 3.Not support language switching, and just available for English user manual book. KR-G19 is a high-end GSM alarm with stable and reliable performance and applies 2.4-inch TFT color screen and touch keyboard with built-in powerful CPU master and excellent operation experience. Host connects pet-immune PIR motion sensors, door contacts, smoke detectors, gas detectors and emergency button accessories etc. 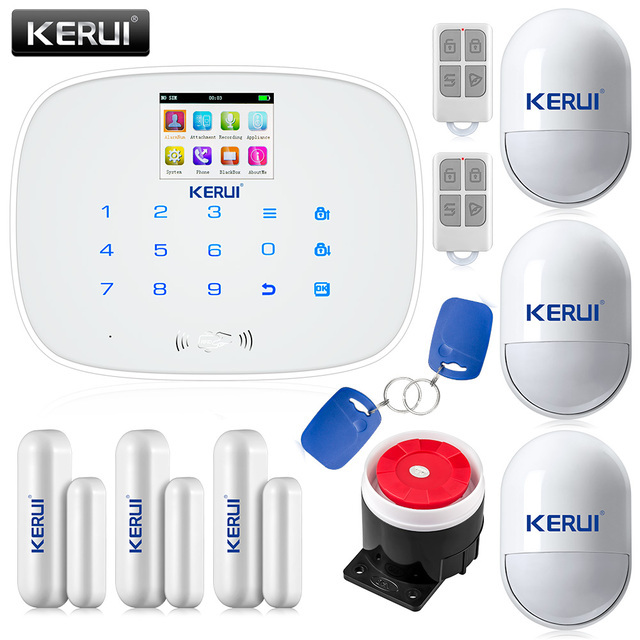 After receiving an alarm, host will display the alarm zone and alarm siren on site, while texting to and dialing the number preset to inform user. It's widely used in houses, factories, schools, shops, convenience stores, financial rooms, villas, communities and other area needed to be protected to ensure the security of the person and property at all aspects. To Set host through phone or SMS remotely, and it 's compatible with China Mobile Fly message function to save user 's SMS costs.